we would like to inform you about what to do before your trip for choosing the most interesting Amalfi travel experience. Our aim is to help you to get the best of your holiday and to not miss anything of these beautiful area! Have you read this title and are you wondering what a Paint & Drink experience means? Don’t worry, Paint & Drink is the totally new event for the coming season! Drinking and painting meet in the splendid setting of Amalfi at the Hotel Aurora Amalfi. In a dream holiday landscape even the people that are not able to draw can fully participate with the artist Jatniel Domingo in the art work. He guides you into natural inspiration from the magical places along the Amalfi Coast. Your skill level is irrelevant! Paint & Drink is really for everyone! Jatniel will guide you through the art class and at the end of the experience you will take home your beautiful picture and the unforgettable memories of it! Classic beach holidays are not for you and you always seek new experiences and activities to feel involved during your travel? Then the Paint & Drink travel experience in Amalfi is just for you! 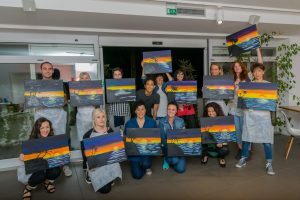 Paint & Drink at Hotel Aurora Amalfi is perfect if you want to have fun, letting your imagination run wild and releasing your creative energy. If you believe that painting is a great way to relax and to have an alternative experience then do not miss this opportunity to create new memories and to get in contact with lovely people in a friendly ambience, sipping a glass of local wine together. DISCOVER EVERYTHING ABOUT OUR SPECIAL PAINT & DRINK OFFER ! Our Paint & Drink package is a unique opportunity to live a great travel experience in Amalfi during the spring enjoying the colours and scents of the coast in this season! Contact us at info@aurora-hotel.it or call us at 0039 089871209 to get more information about the next event and to book! We are waiting for you!